You will get a visa invitation required to obtain a visa. Get the ready-to-use invitation by email. The electronic invitation (e-FMS) from the FMS is issued by the Federal Migration Board in electronic form with a barcode. At submission of the documents, if it is enough copies, then the original is not required. An invitation from the Organization issued to citizens of the United States, Norway, Switzerland, Japan and the European Union, except Great Britain, Ireland, and Croatia. The original is not required enough copies. so they can get a visa as simple, quick and cheap as possible. How to get a visa in plain, simple language. Free consultation and active help in visa issues. Great service, recommend to everyone who values his time and money. I was getting myself ready for the long process of getting a Russian visa, but was recommended to try this service - and it worked! Got my visa quickly and painlessly, thank you! An invitation is one of the required documents for every visa application submitted to the Russian Consulate. It is required for every kind of visa. What is the difference between the tourist visa and the business one? Tourist visa is only valid for 30 days, and generally it is quite easy to receive and least expensive. Business visa is valid for the time period of 1 year (and sometimes it is also possible to arrange it for 3 years), and is usually more expensive and takes more time to get. 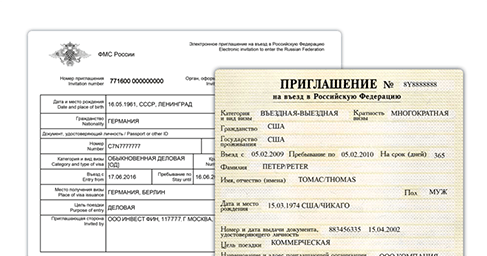 Russian visa is an official document that permits the owner to stay in Russia for a specified time period. The visa contains information about entry and leave date, visa type and the allowed number of entries, as well as owner's passport data and the information about the host organization (visa sponsor). Please note that visa is the document that permits both entry and exit; if you stay in Russia for a period that is longer than specified by the visa or lose the passport with the visa, leaving the country will be problematic. Citizens of most of the countries need a Russian visa to enter the Russian Federation. There is a number of visa free countries as well as visa free trips, please check the official governmental information source for your particular country. How can I change the data in the submitted order for visa invitation? In case you have entered incorrect data, please notify us as soon as possible. The cost of changing the order data depends on the time passed since submitting the order, and the chosen type of invitation. Tourist, business, work, private, family member, transit visa, i.e., according to the purpose of visit to Russia. How to obtain a Russian Visa. Complete guide. I’ll explain how to gather all of the documents you’ll need to apply for a visa from your computer in a way that is quick (less than 1 hour) and cost-effective.